FREE SHIPPING! Use the drop downs below to build your bed. Matching Casegoods Available. Order Below. Designed with simplicity in mind, this popular 2” single-tier headboard offers the high quality construction most shoppers are searching for. Includes headboard, frame, deck boards, and 9.25" Pedestal, or choose other options below. (Shown with 9" 6 drawer pedestal). Available in Honey Oak, Unfinished or Walnut finish. 1. Solid Pine Construction • Durability and quality to offer years of worry free use. 2. Protective Beauty Buttons • Offer the finished look of high quality furniture and prevents snagging on exposed screw heads. 3. Available In Honey Oak Or Medium Walnut Finishes • Provides the flexibility of choice to compliment any bedroom. 4. High Resolution Portrait Mirrors • Create true reflections without distortions from premium quality glass normally reserved only for the finest home furnishings. 5. 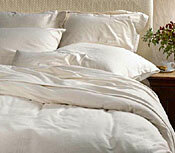 Sculpted Pillars & Tops • Exquisite detailing to present the look of elegance in the bedroom. 6. Tongue & Groove Panels • Crafted to provide durability and strength for years of service. 7. Multi-tier Shelving • Additional storage and display space eliminate clutter and offer function. Warranty pertains to seamed areas during the manufacturing process. 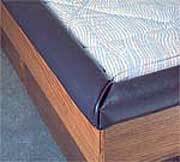 (The area of the vinyl that is heat sealed together to make up a waterbed mattress.) Warranty does not cover the flat part of the vinyl. Warranty does not cover shipping charges. All warranties must be accompanied by a receipt from The Waterbed Doctor. 1 to 7 years free replacement for any heat sealed seam failure. 8 to 15 years customer pays 70% of the most recent suggested retail price. After 7 years a 50% discount off suggested retail price at the time of warranty claim. Select from 8 waveless styles - Full Motion to 100% waveless with Lumbar Support. Standard 9.25" Pedestal - no drawers Pine 13" Princess Pedestal with 6 drawers. Pine 9" Pedestal with 6 drawers. Pine 18" Captain's Pedestal with 8 drawers. BUILD YOUR BED HERE USING DROP DOWN SELECTIONS. The Grand Universal Canopy Kit is a standalone canopy. A magnificent addition to any bed, except Briarwood. Shown with optional Lexington headboard (not included). Order bed separately. BUILD YOUR BED HERE USING DROP DOWN SELECTIONS. 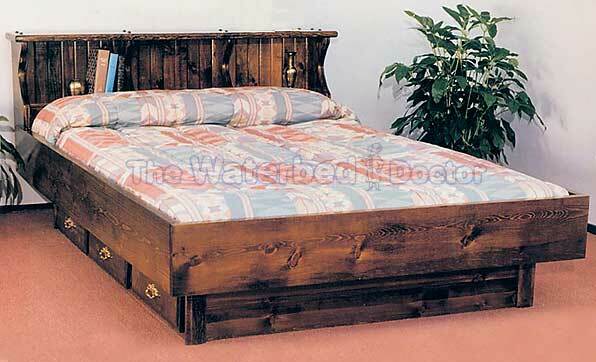 The Pinewood headboard comes with frame, deck boards, 9.25" Pedestal. FREE Free Flow Mattress, Fill & Drain Kit, Liner & Heater. All Made In The U.S.A.